I've had an overload of carrots lately. I don't really know how, we seem to go through them a lot but there's still a ton in the veggie drawer. I decided to make a batch of my spicy carrot spread to use a few of them up. It's not too spicy so there was a chance that the kids might have a few bites too. I was having a daydreaming type of day because as I was cooking the carrots, I realized that it was almost time to start getting dinner together. I could tell by the amount of whining I started to hear. Problem was, I had no dinner plan. The whining continued to increase and fast! I started to get veggies and beans and a few thing together for the kids. I decided to spread a little carrot spread on a tortilla for them. They loved it. Now that the kids were fed and happy, another realization hit ... I didn't have dinner ready for Paul and I! Ugh! Since the kids liked the carrot spread on the tortilla, I decided I could make wraps for us too. I quickly put a marinade together for some tempeh and away I went. 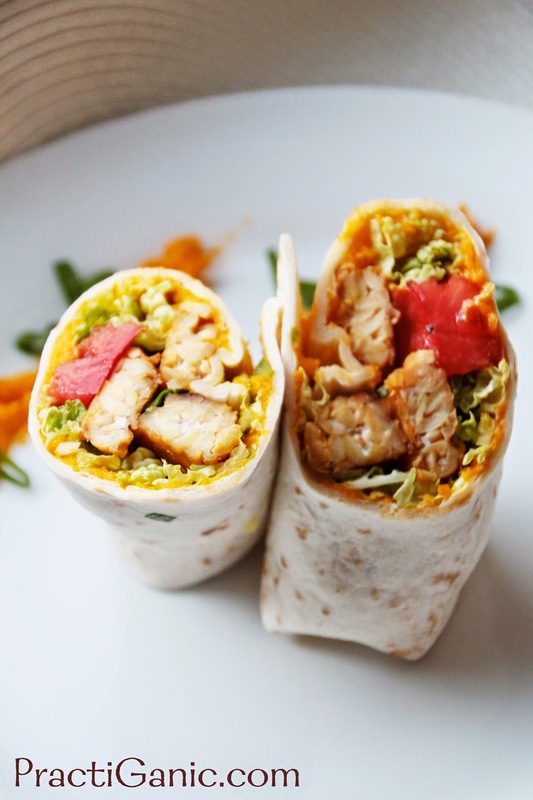 Smoky, sweet, spicy ... there is so much flavor going on in these wraps. They were delicious and most importantly for me that night, quick and easy. I always make a double batch of the spicy carrot spread. After having it, you're going to want to use it as a dip or spread it on everything! Slice tempeh usually about 1/2 inch thick. Mix the syrup, tamari, coconut oil, garlic powder, paprika, and liquid smoke. Marinade the tempeh in the mixture for at least two hours (I didn't marinade this long the first time I made it and it definitely needed more time). Preheat oven for 375º. 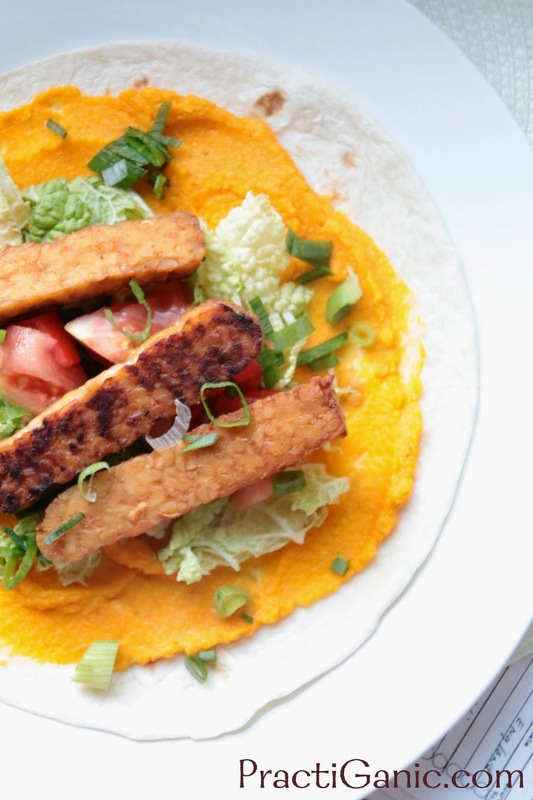 Take tempeh out of marinade and lay tempeh slices on a sheet tray, save your marinade. Bake them for 12-15 minutes on each side. Once done, mix them back in the marinade. On your floured tortilla, spread the spicy carrot spread. Top with cabbage, tomatoes, tempeh and green onions. 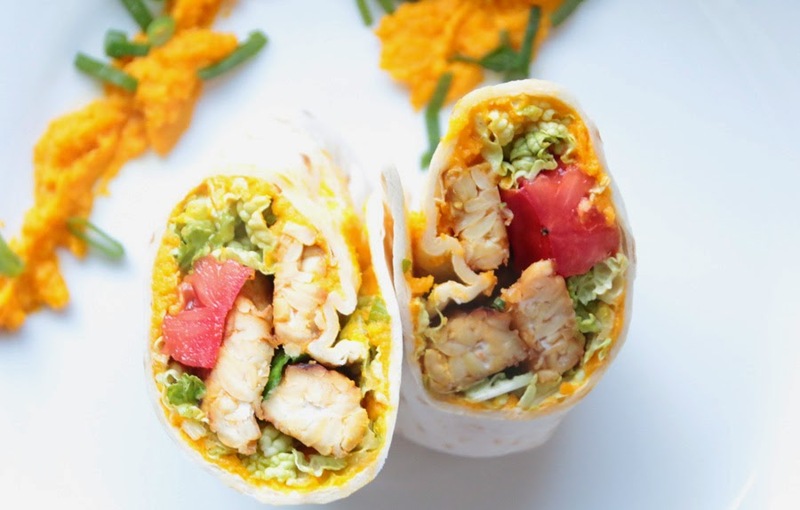 Wrap up and eat!